For the second year in a row, the Excellence in Journalism Conference — a joint effort between the Society of Professional Journalists and the Radio Television Digital News Association — was an incredible success. If you attended, spoke, exhibited, performed, volunteered or followed along online, thank you for being part of the big event. If you couldn't join us, this collection of recaps, photos, streaming audio (free to all SPJ members) and Working Press coverage is the next best thing to being there. 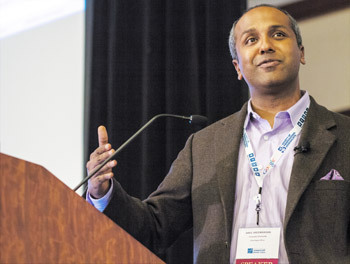 Description: Sree Sreenivasan (@sree) is the first Chief Digital Officer at Columbia University, where he teaches in the digital media program. A specialist in explaining technology to journalists and the general public, he has written for The New York Times, BusinessWeek, Rolling Stone and more, and has reported for WABC-TV and WNBC-TV in NYC. He writes a social and digital media column for CNET called Sree Tips, also the name of his popular Facebook tips page. Sree was named by Poynter as one of the 35 most influential people in social media in 2010 and was on Quills 20 Journalists to Follow list in May 2010. 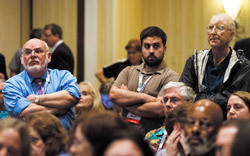 He will speak to EIJ12 attendees about leveraging digital technology in journalism and improving their use of social media. Description: Edward R. Murrow harnessed the power of both radio and television to teach, illuminate and inspire. As we blaze new trails in the digital age, how can we apply the innovation, ethics and substance of Murrows work to todays journalistic challenges? 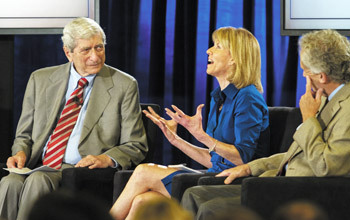 RTDNA and SPJ are proud to present a special edition of the highly acclaimed public television and radio series The Kalb Report, moderated by legendary journalist Marvin Kalb, the last correspondent personally hired at CBS News by Edward R. Murrow. Joining Mr. Kalb are Mr. Murrows son Casey Murrow, New York Times Managing Editor and Pulitzer Prize winner Dean Baquet, ten-time national Emmy Award winning CBS News Correspondent Erin Moriarty, and public radio legend and Murrow biographer Bob Edwards. Description: Video cameras have evolved over the years, getting cheaper and lighter. The multimedia world has evolved into using smaller cameras, whether it is DSLRs or even point-and-shoots. Many of those cameras provide high-quality images at a fraction of the cost of high-end video cameras. 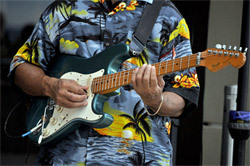 Yet they have drawbacks such as getting good quality audio and getting steady hand-held video. Videojournalists will learn the best way to get good video and sound with small cameras. Description: Now that the U.S. Supreme Court has weighed in on health reform, what stories should reporters focus on? One presidential candidate promises to repeal the Patient Protection and Affordable Care Act, another to enhance it. Either way, changes will affect every community in America. Where do we stand at the moment? What stories can be done before the year ends? Learn how to localize this huge story that touches everyone. Description: A cant-miss for news leaders who are ready to create real results from social media. This step-by-step guide will show leaders of print/broadcast/online newsrooms how to take stock of the way their staff currently interacts with social media and then implement strategies to improve content curation and viewer engagement while setting goals for website traffic referral, fan acquisition, ratings and revenue. Walk away with a simple, executable action plan for implementing best practices, increasing accountability and limiting liability. Description: Nearly 70 percent of the nation believes if the local newspaper were gone, it would not be a big deal. Should journalists be better explaining their impact? How? If they don't, who will? As a general rule, should journalists move beyond informing communities to engaging them? Again, how? Bring your ideas. The audience will drive this discussion. Description: As the Castro era ends, Cuba is changing dramatically, loosening some restrictions on citizens and property ownership and perhaps moving to a less centralized form of government. What are the changes taking place in Cuba today? Could these transform this repressive country into a more modern, dynamic nation? What do the changes mean for the Cuban people and the relationship between Cuba and the U.S.? What are the resources for covering this important story? Description: Tweeting, blogging, posting online, writing for print and broadcast: just another day in the life of a journalist in 2012. But how do you get it all done in a way that best serves your audience and most efficiently uses your time? The key is picking the right way to tell each story. When you leave the session, you'll be able to do it, too. Reporters and managers will be better equipped to navigate their way through today's crunching demands, from real-time breaking news to filing a polished final product. Description: So you landed your dream job as an investigative reporter. What do you do now to take your game up a notch? Walk away with ideas, strategies and a cheat sheet full of links to jump start your next big project. No matter how long you've been doing enterprise work or no matter your platform, theres something here for everyone. Description: All these things require your attention and a profile, but there are only 24 hours in the day. How do you manage social media accounts for your personal brand? Should you mix them with your professional brand? Get tips on combining both a professional and personal brand as well as hear time management suggestions on staying on top of all your networks. In addition, get a how-to for Twitter and Facebook, working with Google+ brand pages. Description: You have a degree, now what? Its challenging to find a job, not to mention a job in journalism. But it can happen if you become proactive and prepare. Get tips on how to stand out from the competition and land a job. Presenters: Jennifer Nicole Sullivan, copywriter, Real Simple magazine & fashion/entertainment/arts freelance writer; Lynn Walsh, investigative producer, WPTV, West Palm Beach, Fla.